Vic Records live and breathe in the past and this old fart appreciates their hard work and dedication to bringing all of us those lost classics. The past is alive indeed! 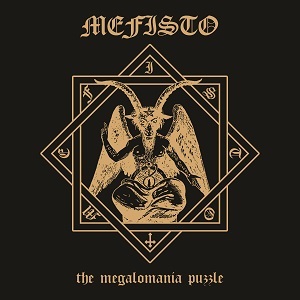 If you were like me and somehow missed out on Sweden’s influential Mefisto during the tape trading teen years, then Vic’s got us covered with The Megalomania Puzzle. This career retrospective CD (LP coming later) finds both of the bands demos in one convenient place, featuring liner notes penned by Metalion (Slayer Mag) and the members of Mefisto themselves. For all intensive purposes, this short lived power trio may be a bit amateurish around the edges, but their atypical approach to creating thrashing death metal made them WAY ahead of their time. Even though they may not have been understood back in 1986, there is no denying their innovation for carving out their own special place in the archives of metal with nearly every heavy band coming out of Sweden during that era being influenced by Mefisto in some form. The mid 80’s was a nebulous time where some thrash bands in Europe/Scandinavia began morphing into something far darker than the at times more lighthearted spirit of thrash. The vocals were taking on more of a demonic delivery. The guitars dropped in tuning and the distortion exploding from the amps possessed the power to level an entire field of grazing buffalo. Mefisto’s music shines for it’s underlying atmosphere and stellar guitar work. Omar Ahmed’s playing skills felt classically trained, for all of his solos are tasteful, though technically gifted. His riffs were firmly rooted in tight thrash with a sinister undercurrent to carry them along. Sandro Cajander’s vocals had embraced the death/black metal aggression and misery and it fit perfectly within the songwriting style, but his delivery seems a bit underdeveloped to me on certain songs. Further rough around the edges moments can be found in the drum performance. Roberto Granath is hanging in there, but that double bass plod is teetering on the brink of a sack of potatoes rolling down the stairs. Still, I appreciate the style and hungry feel emitting from this material even if Mefisto’s creative yearnings may be just outside of their technical ability. ~ by martyworm on June 25, 2014. This entry was posted on June 25, 2014 at 7:09 pm and is filed under ALL REVIEWS, M-reviews.You can follow any responses to this entry through the RSS 2.0 feed.You can leave a response, or trackback from your own site.